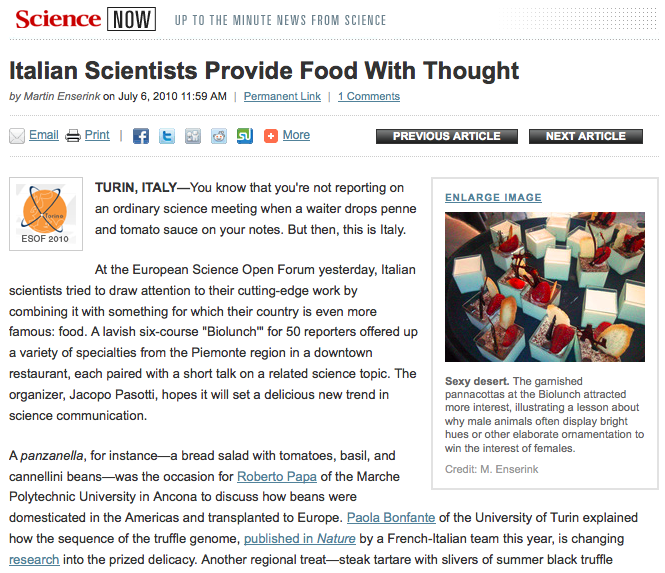 The first edition of Biolunch, an event designed to favor communication between scientists and journalists, took place at ESOF 2010, in Turin. The event, which was part of the scientific programme, was created by Jacopo Pasotti and realized with the help of Fabio Turone (both members of SWIM-SWITY), and was very appreciated by attending scientists and journalists, including Science’s correspondent Martin Enserink, who wrote about it (By the way, <a href="http://news.sciencemag.org/2010/07/italian-scientists-provide-food-thought" onclick="_gaq.push(['_trackEvent', 'outbound-article', 'http://news.sciencemag online task management.org/2010/07/italian-scientists-provide-food-thought’, ‘Martin’s article, available online’]);” target=”_blank”>Martin’s article, available online was awarded the prize for best article on the whole ESOF event). Here are some comments from scientists and science journalists attending the event.